Hello you might not know me but i would like a moment of your time to check out this project i'm working on. After trying out almost every option there is for vanilla i've come to the totally sane conclusion that i would write my own unitframes. Now that its been several years in development it has grown into one of the best UFs available for the vanilla client. The first line in this macro is equal to a '#show' you might know from live WoW. With this, bar addons that color your bar depending on if you have the mana for the spell will pick it up even though its a macro. Its optional. This supports MobHealth3 (but you have to install it ). Get BonusScanner if you are a healer to factor in any bonus healing you might have. Q: How do i move stuff? A: There is an unlock button in the configuration. Raidframes are moved by dragging their text (GRP1 etc). Q: Can i have spinning timers on anything other than player? A: No, not possible with the vanilla client. There could be unreliable timers but i'm not gonna do that. Q: Why is there no 40y range check? A: There is a 40y check but it doesn't work as reliable as the 30y one. Read point 4 of this post and point 1 of this one for a detailed explaination. Q: Why can't i see health values for enemys? A: As stated above you have to install MobHealth3. Also read point 3 of this post. Q: How do i turn off portraits?? A: Turn portrait to bar -> Choose portrait from the second dropdown -> move the slider below that dropdown all the way to the left. Q: I am getting tons of LUA errors! If you get LUA errors please post something like a report from ImprovedErrorFrame and what you were doing at the time. Or anything else that might help to describe the issue. A: Sure... when i feel like it. You can always ask tho. Also check the list first if its already added. A: I'm glad you like my work. Last edited by Rhena on Tue Jan 19, 2016 9:07 pm, edited 13 times in total. Last edited by draxlt on Tue Mar 31, 2015 10:08 am, edited 1 time in total. The newest version has party targets. I'm going to check it out soon. Thank you so much for this addon. I love it! -Would it be possible to make the frames even smaller (I want to make the target target really small for example). 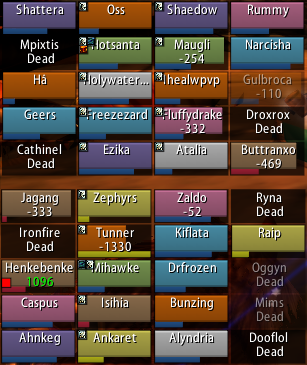 -Would it be possible to make the buffs/debuffs bigger/smaller? I know that decreasing the amount of buffs makes them bigger and vice versa. -Same thing about the font, bigger smaller etc. Maybe there are a couple of improvements that you could implement in your version (with his permission?). 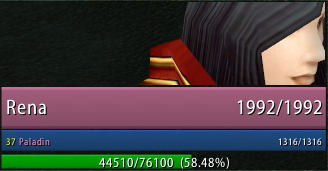 draxlt wrote: And, can we get health numbers on yoruself, instead of just percentage? What? I have no idea what you mean. draxlt wrote: -Would it be possible to make the frames even smaller (I want to make the target target really small for example). draxlt wrote: -Would it be possible to make the buffs/debuffs bigger/smaller? I know that decreasing the amount of buffs makes them bigger and vice versa. They are supposed to go the whole length of the frame. Thats not going to change since thats one of the features i personally wanted. draxlt wrote: -Same thing about the font, bigger smaller etc. The font is supposed to adjust itself because doing it manually would require you to set up more than just a simple slider. This is supposed to be easily configurable unlike something like Discord UF for example. And yes i have already scraped off everything that was usable from the "continued" version. But what if i dont want to see party targets (like in previous versions)? 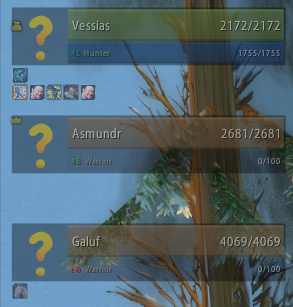 Is there an option not to see party targets?